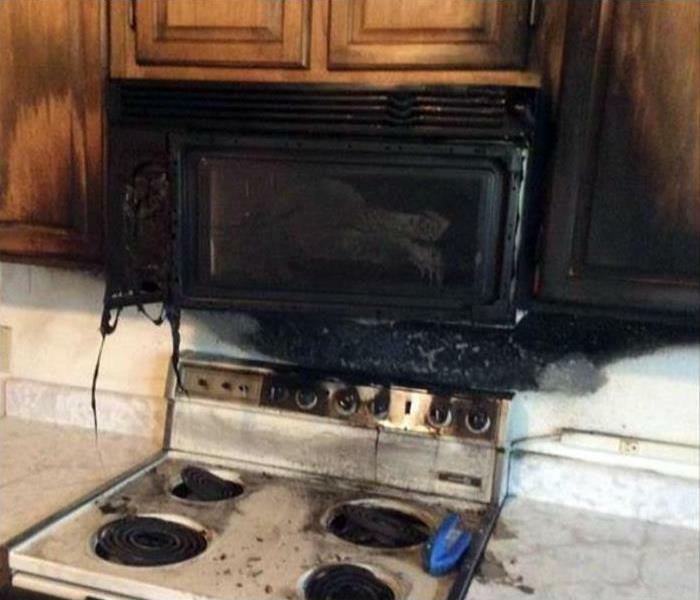 You need to contact our experts if your Gilbert home experiences a fire. Our crew is ready 24/7 and Faster to Any Size Disaster. We are IICRC certified in fire restoration. SERVPRO of Gilbert has the expertise, advanced training, and specialized equipment to restore your home to pre-damage condition. 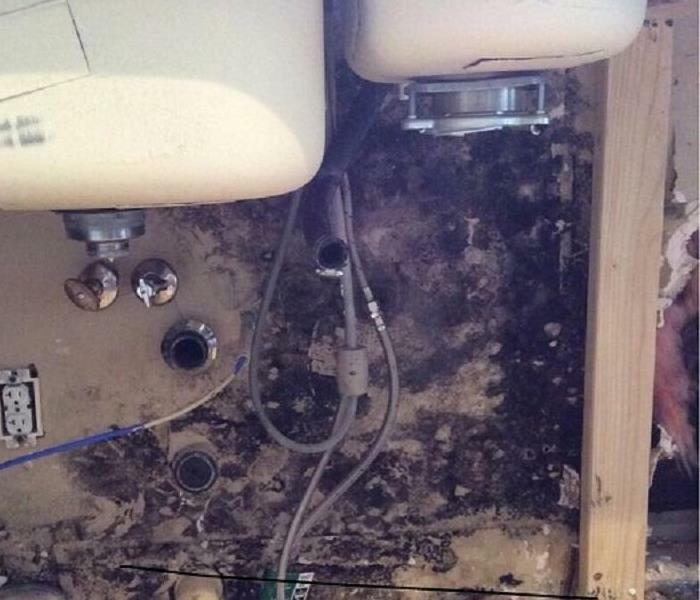 This homeowner called SERVPRO when the reverse osmosis system in the upstairs bar area failed. As you can see, the damage was significant. After stopping the water source, we removed the standing water and damaged materials. We then thoroughly dried the structure and applied an antimicrobial to inhibit future mold growth. The owner was pleased with the results. SERVPRO of Gilbert is always on call to handle your water damage emergencies. 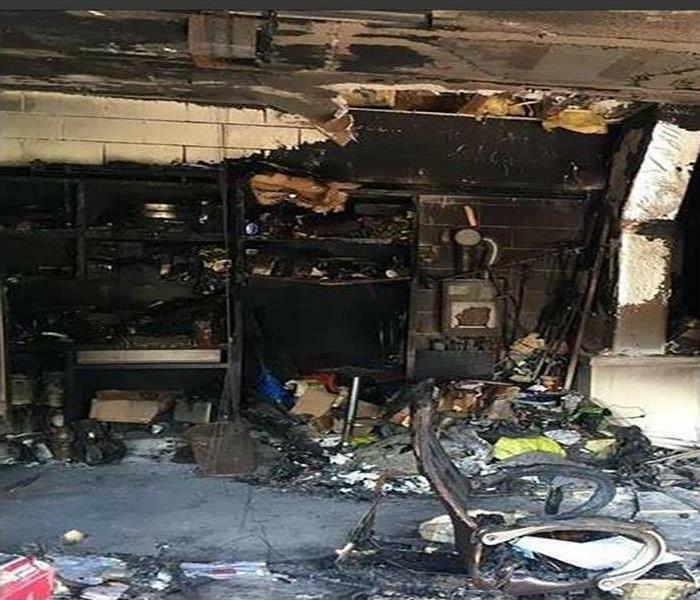 House fires can spread rapidly and destroy much of a home in San Tan Valley in a matter of minutes. 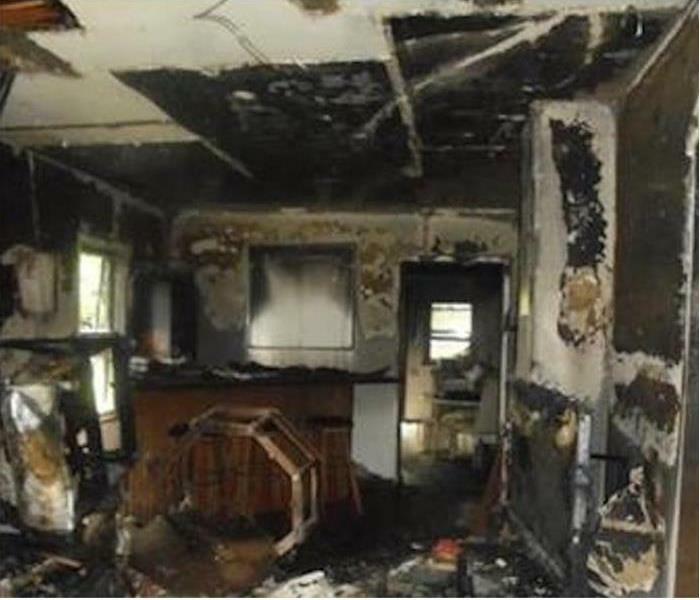 Though SERVPRO cannot respond and arrive within minutes of a fire-damaging event to your property, We're Faster To Any Size Disaster; we get there promptly to mitigate the structural damage and always try to salvage content and items of personal importance. 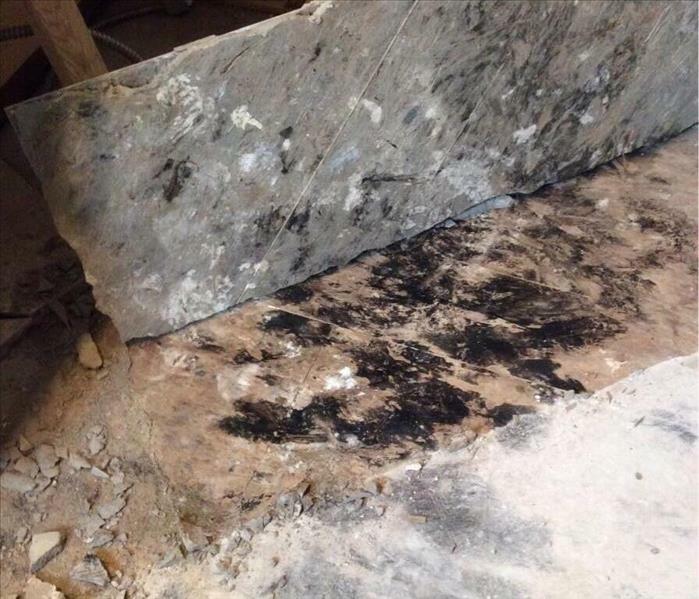 We can start to remove the charred debris and work with our customer and their adjuster to expedite the service and make it as seamless as possible. 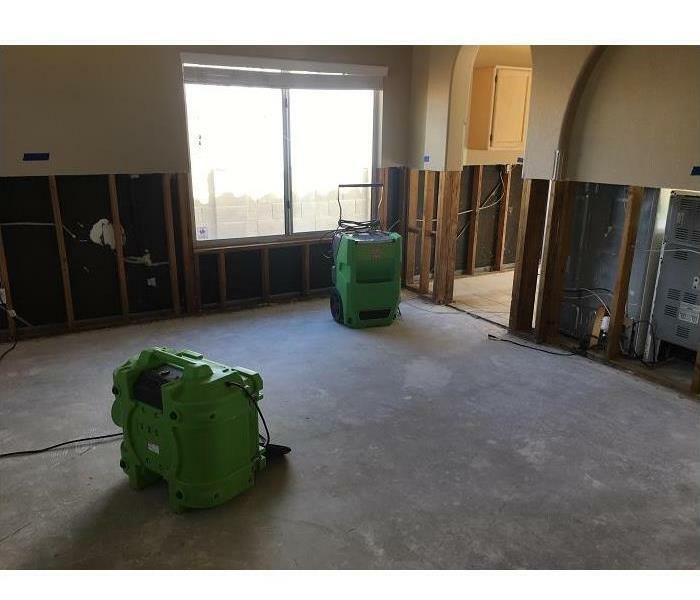 This Photo illustrates the efforts that a SERVPRO team can make in the Gilbert area after a severe flash flooding. 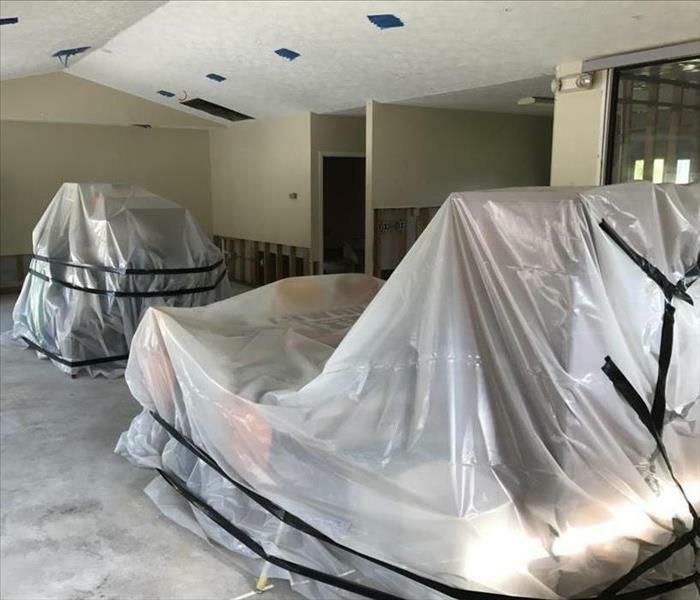 The furnishings are still wrapped in plastic to protect them even after the structure has been gutted of a commercial grade carpet. The walls are flooded cut to minimize the replacement material. 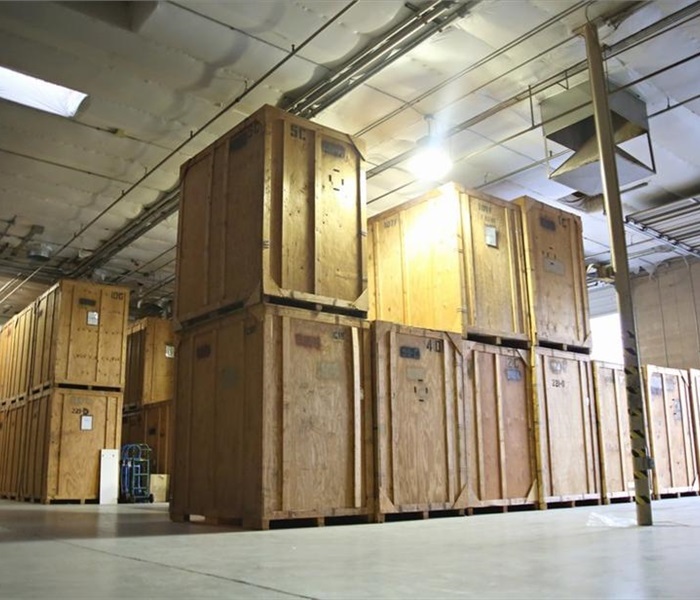 We protect our clients' contents as we work; we do it right. Call us for a prompt response to any water, fire, or mold problem your home or business may encounter. 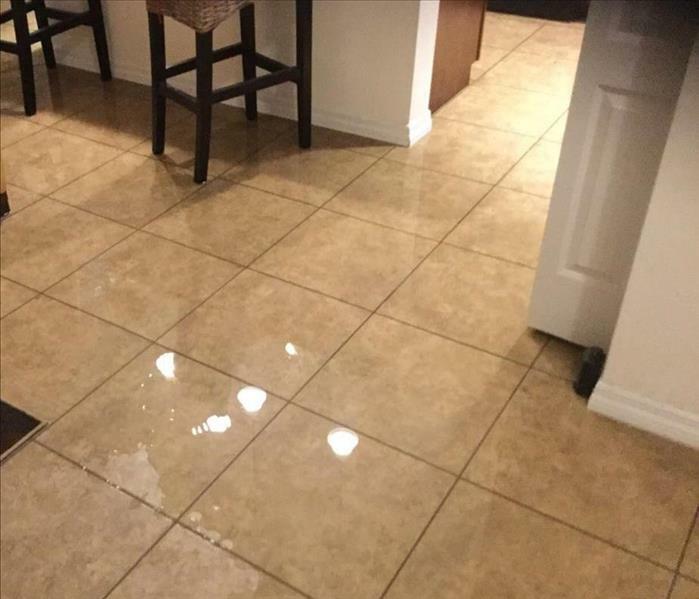 The ruptured water line feeding the dishwasher left more than just a puddle on this tiled floor in a Gilbert area home. The hidden dangers of secondary water damaging resulting in damaged trim work and mold growth are always a real possibility. SERVPRO can remove not only the water from visible areas, but check with moisture meters and a thermal imaging camera to ensure that no hidden pockets of moisture go unnoticed. With us, there are no surprises down the line. Call us for water spills, get it done right. Monsoon season brings strong winds and rains that can breach a roof in Gilbert and drench the small attic space with wetness. SERVPRO techs can rig a flat lay conduit and contain the ceiling area to force in the air from a dehumidifier to hasten the drying process. We're Faster To Any Size Disaster. 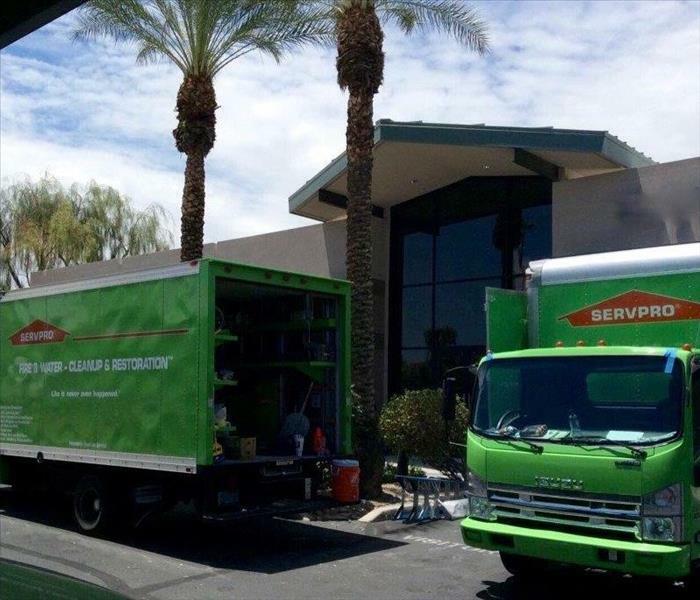 When a local Gilbert church made the call for emergency assistance for a water loss, SERVPRO, because We're Faster To Any Size Disaster, responded almost immediately. Our team has the training, experience, and advanced equipment to handle any large scale commercial water damaging event. Drying out this structure was expedited by arriving with a trailer-mounted desiccant dehumidifier and a self-contained generator. The Photo depicts lay flat tubing connected to the desiccant that is pumping dry air into the building. We can mitigate water damage to building materials and fixtures with a rapid extraction of water vapor as we achieve a standard RH relative humidity of below 55 percent. 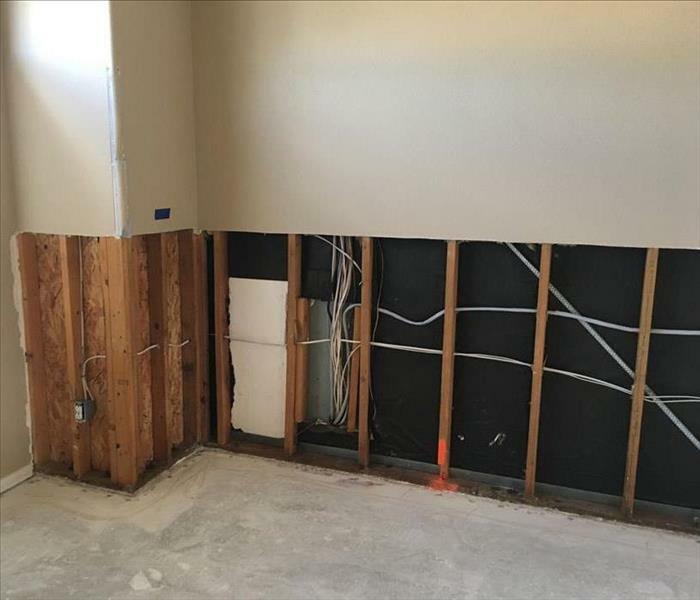 Count on us, as many property managers, insurance companies, and municipal agencies do for a professional solution for water damage cleanup and restoration. The Black Water filled with contaminants required a "flood cut' for several reasons in the Gilbert property. The discarding of wallboard immediately removes excess moisture from the premises, possible pathogenic microorganisms are removed, and the framing is exposed for drying and disinfecting. SERVPRO has the solutions to your storm-damaged property. When your Gilbert home experiences a fire, our crew is here to help. We are locally owned and operated, ready 24/7, and Faster to Any Size Disaster. SERVPRO of Gilbert has the training, fire damage experience, and state-of-the-art equipment to restore your home to pre-damage condition. 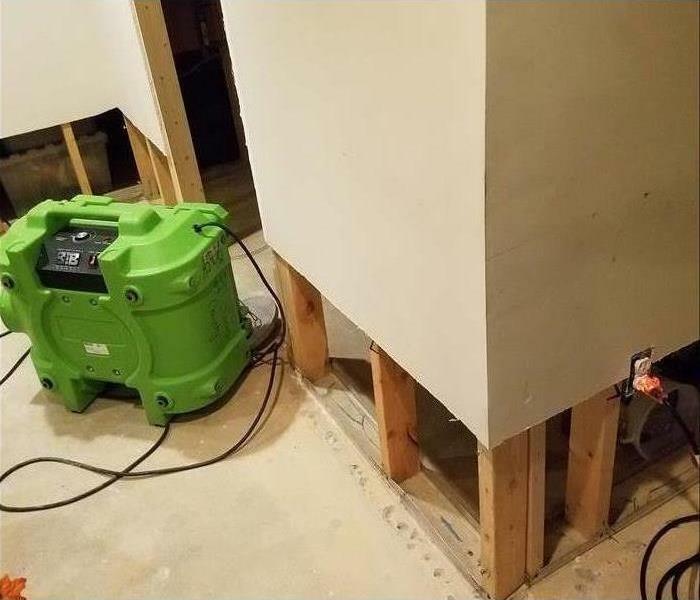 This homeowner was glad they called SERVPRO when unexpected water entered their home. After removing the water, we cut into the drywall to remove all damaged materials and to help facilitate drying. We also applied an antimicrobial to the structure to inhibit future mold growth. Now, this house is ready to be restored. 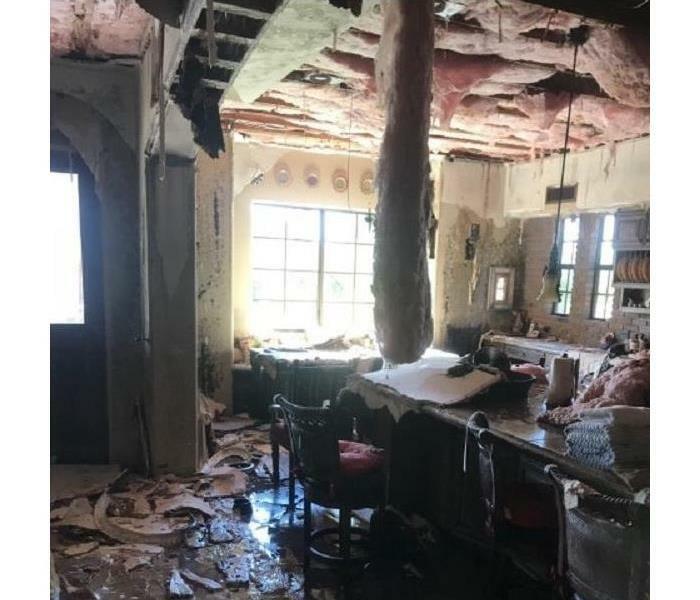 Not all water damage issues require cutting away drywall, and SERVPRO of Gilbert has the expertise to dry your home correctly. We are available 24/7. Call us anytime! 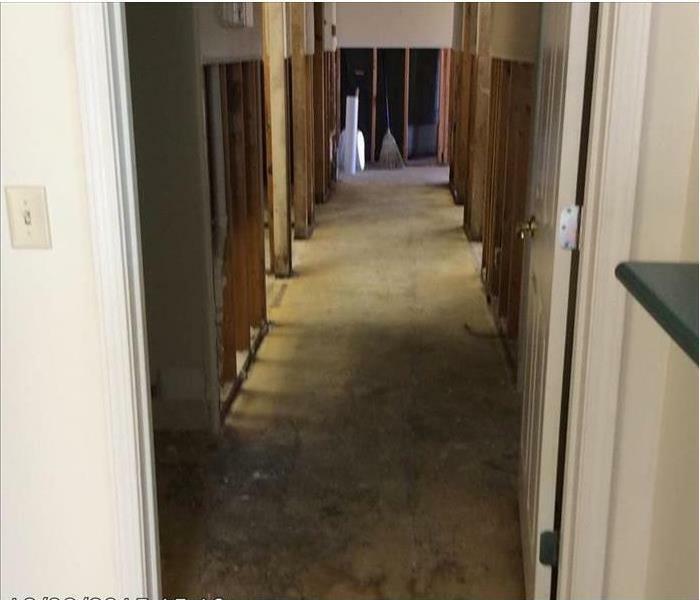 When SERVPRO answers a call for commercial water damage remediation, it's all hands on deck. Team SERVPRO arrives on location with the technicians and equipment to effectively tackle the situation and make it "Like it never even happened." Call right away for best results. Often a controlled demolition, in this case, a "flood-cut," the most efficient technique to dry out and restore a structure affected by a flood ob contaminated water in the Gilbert area. 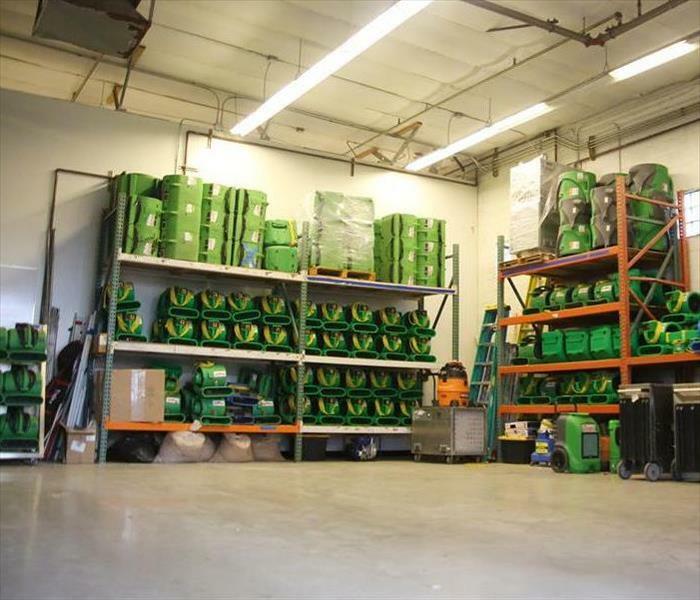 SERVPRO's local Franchise is stocked with leading products and equipment to grapple with any storm type of damage. Ceiling leaks can go unnoticed in a Higley home until the water stains are no longer ignored with a hanging panel. 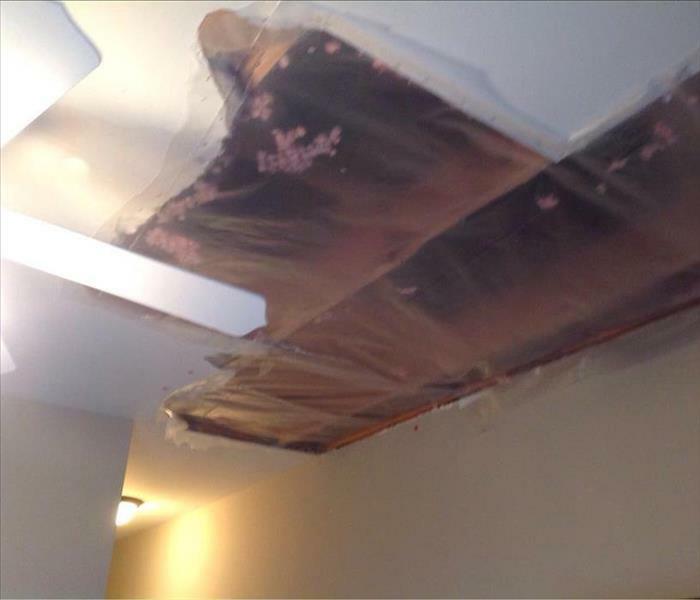 SERVPRO can remove the hazard, dry out the attic space and contain the damaged area until a repair can be done. Count on us for help. 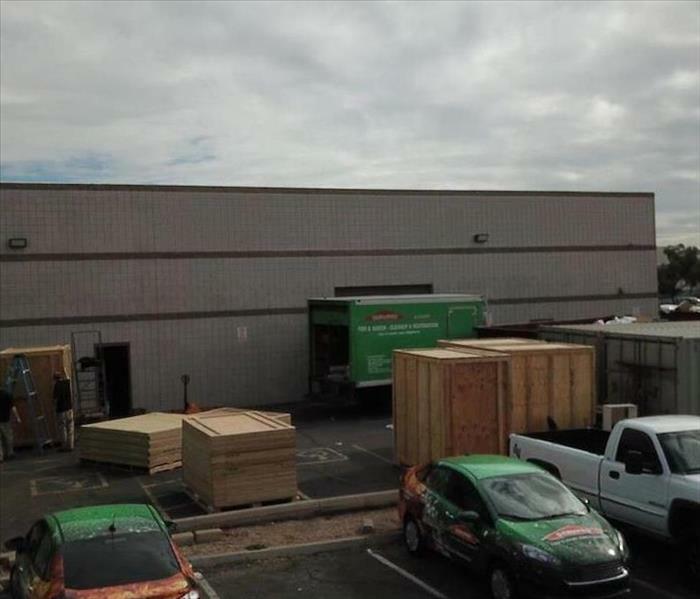 SERVPRO of Gilbert is located at 45 N. Sunway Dr. in Gilbert AZ. We are in a 14,000 SF. Facility on 1.5 acres. We are well established and will be here for many years to come. 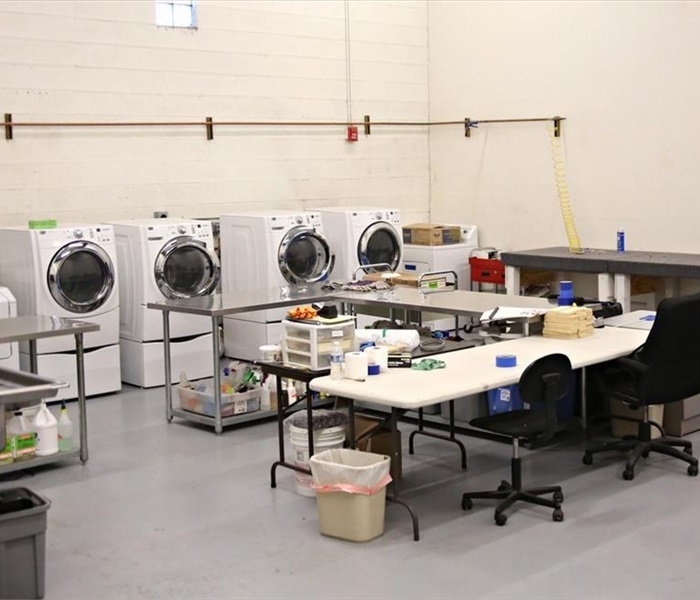 Our laundry area is equipped to handle laundry that has been soiled due to a water loss or smoke damaged in a home fire. 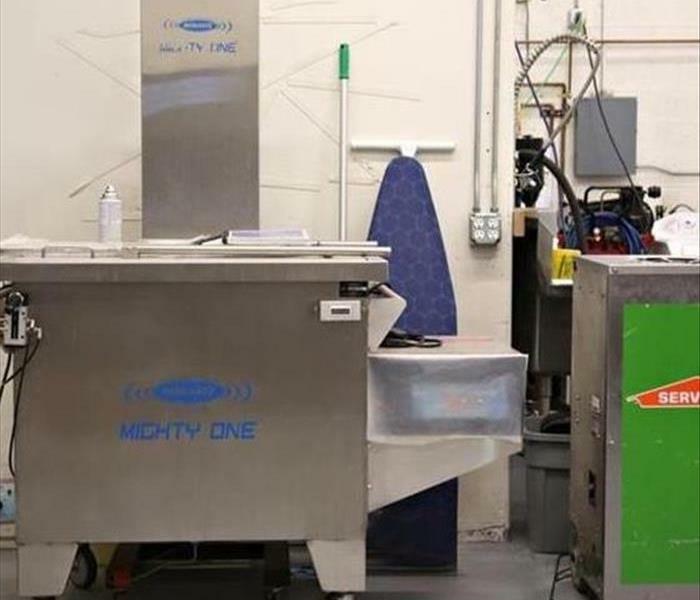 Our content technicians will have your clothing fresh and clean in record time. We handle any job large or small. This is our large loss trailer that has traveled to NY in Hurricane Sandy and the Wallow fires in Northern Arizona. 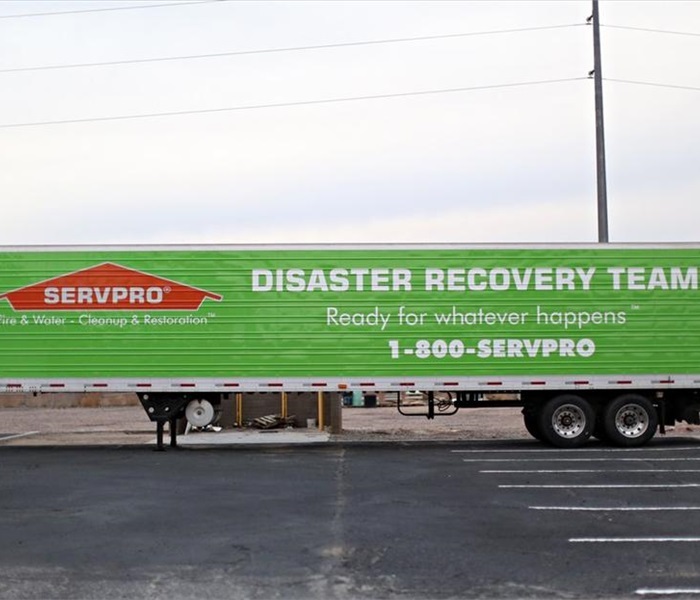 We are a member of SERVPRO's large loss team that is supported by 1500 franchises. Mold thrives when moisture is present and can start spreading as quickly as 48 hours after a water damage situation. SERVPRO of Gilbert has equipment and training to take care of your mold and water problem quickly and safely. 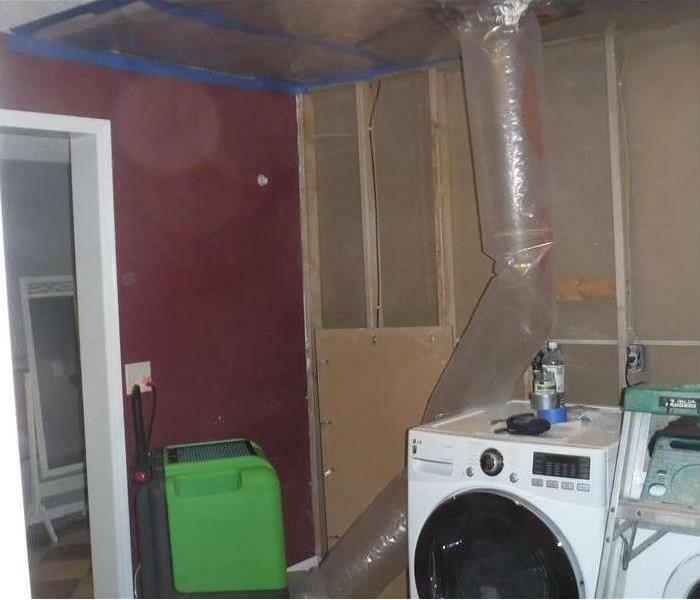 Unattended water leaks can quickly turn into a dangerous mold problem, as in the case for this Gilbert family. 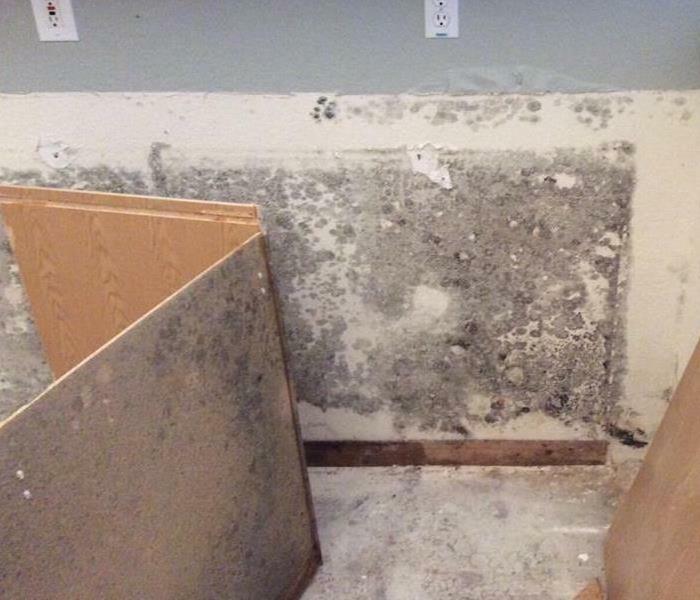 If you find yourself dealing with mold, call us immediately. Our technicians at SERVPRO of Gilbert are highly trained in removing mold contaminants in an efficient and safe manner. "Like it never even happened."